I just love this Limited Edition Brush set by Tarte. The Brushed with Destiny set of 5 Bamboo Brushes with makeup bag ( $44/ bag not pictured , but its a cute bag that will come in handy when traveling!) is amazing. This set includes the following : from left , the balancing act bamboo foundation brush - ( I love using this to contour ( liquid / powder) so there is two uses for this your foundation or sculpting your features ) , the buffer airbrush finish bamboo foundation brush - ( this really does give a airbrush finish, I was pleasantly pleased with my results.) , the contourtionist bamboo cream blush and contour blush - ( This also works great with foundation as well, or your BB/CC creams ) , double-ended bamboo eyeshadow brush - ( no complaints on this two in one is always a plus) , undercover lover bamboo concealer brush - ( I actually love this brush for applying eyeshadow bases to the eye lids, as well as for shadow , the flat surface really packs on the color with a nice pigment, and also great for applying glitter to the lids. ). This set is perfect to gift your makeup loving sister/mom/bff or even yourself - actually it is a MUST to gift yourself. I love these brushes a lot I hope that Tarte makes them part of the collection permanently. Out of all the brushes I would day the balancing act bamboo foundation brush is my absolute fav, I have not had a brush like this ever and it gives editorial quality results. 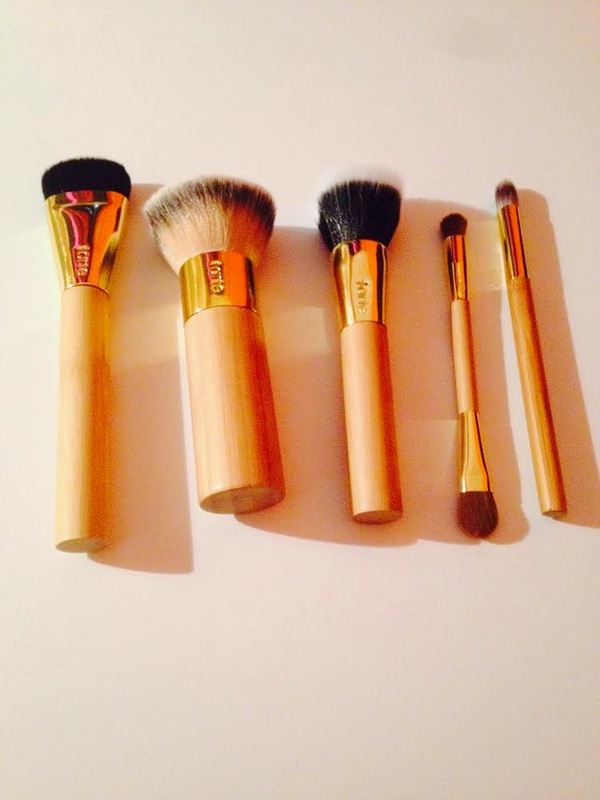 Given this whole set is the price of one brush elsewhere it is beyond a steal. You have got to check it out before its all gone! Happy Holidays and Happy Shopping !